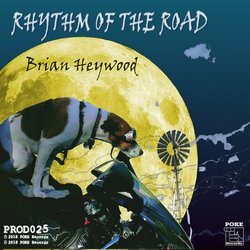 Brian Heywood is an Australian musician who plays live in both the Roots/Fusion genre and the Rock/Pop world. As well as live performance, he also composes for live and video/film soundtracks, produce and engineer for recordings in a variety of styles. Specializing in edgy roots fusion music, previous work has received comments such as "... aggressive, top notch fiddling set off by periodic guitar explosions." - Tom Nelligan, Dirty Linen Magazine (USA), "Just when it seemed as if newer electric British roots bands were getting thinner on the ground - Very welcome and very good." - fROOTS Magazine (UK) and Steve Barnes Fairbridge Festival Artistic Director (Australia) - "... a rocking band - I was delighted with the audience response." Brian's original material draws on many sources from progressive, Latin and blues rock of the 70's to Celtic and traditional material. Brian started his professional career performing in the pubs and clubs of Sydney. He relocated to the UK in the early 80's and is now back in Australia and living on the mid north coast of NSW. This is a laid back Latin / Jazz /Pop sound with a traveling theme.